The oldest surviving “knotted” rug was discovered by two Russian archaeologists moldering in a “kurgan” in the Pazyryk Valley, or Valley of the Dead in the local Telengit language, near the Altai Mountains of Siberia. The rug is described as “knotted,” and thereby manufactured by hand, to differentiate the Pazyryk Rug from other, perhaps earlier rugs that were nothing more than animal skins thrown on dirt floors. “Kurgan,” a Turkic word meaning mound of earth and stone, refers to the burial mound it was discovered in; but for that mound and Siberia’s miserable cold and deep permafrost, the rug would not have survived the approximately 2500 years since its internment as part of some Scythian noble’s burial goods. And no, this is not the character named Kurgan dressed in animal skins and swinging a yard-long sword that tried to kill Christopher Lambert’s character in the original Highlander(1986) movie. On the other hand, Clancy Brown as Kurgan might give us an idea of what the Pazyryk Rug’s original owner might have looked like. Not someone you would want to deprive of his favorite rug, even in death! 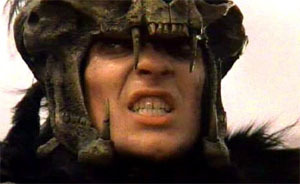 Or maybe that was what The Highlander was all about; Kurgan just wanted his rug back! It was all just a lack of communication! Mean lookiing Dude, isn’t he? 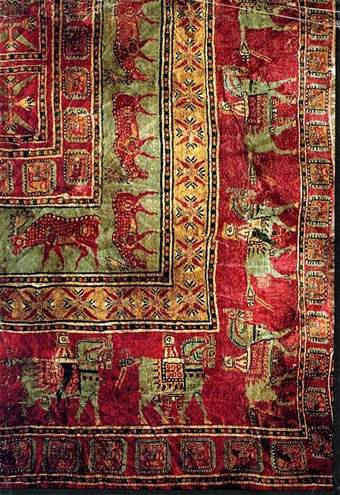 Although the rug belonged to a Scythian, a war-like tribe of nomads who carried no more belongings than could be pulled in carts, the Pazyryk Rug is believed to be of Persian Origin. (Some experts, of course, disagree but we will discuss that in a later post. 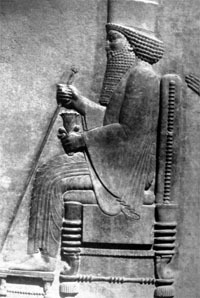 )Those experts that see the rug as a Persian export claim that the rug’s border bands are decorated with with figures of horsemen reminiscent of those surrounding“Xerxes Thorn” in his capital city of Persepolis. you will find that a number of rug sellers who probably should know better have copied the original blogger’s error in their online advertisements. If bad spelling, like bad money, drives out the good, 2500 years from now it will indeed be Xerxes Thorn. Of course it’s always possible that I am the blogger in actual error and there was a Xerxes Thorn. The background of RUGS4 is a blown-up copy of one of the twenty-eight horsemen on the Pazyryk Rug.